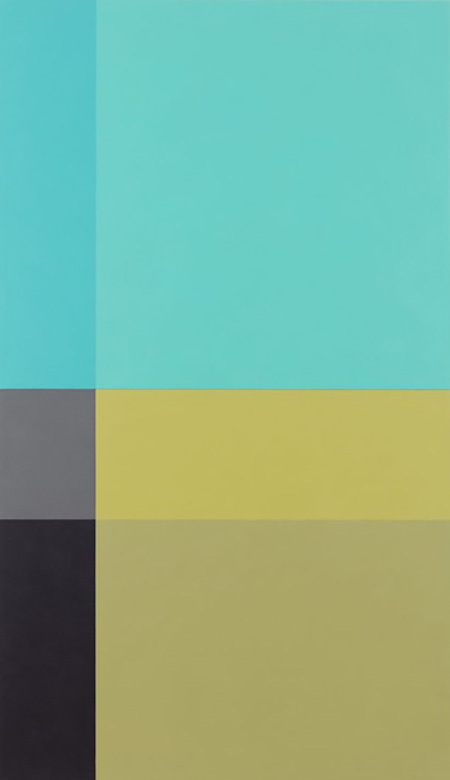 Donald Roy Thompson, "Cipres 140," 2017, acrylic on canvas, 72 x 42"
Though the journey to completing the “Echo Series” was a long one, it was well worth the wait. Executed in acrylic on strictly rectangular canvases, these paintings are exacting and defined. Shape, form, and composition are only slightly altered from piece to piece, and each block of color is so uniform as to seem mechanically precise. But this meticulous precision is what so beautifully highlights the color field aesthetic. Movement, depth, and variation are strictly expressed through color, and Thompson has a keen sense of it. Within each canvas, Thompson experiments not only with hues, but tints, tones and shades to create a color narrative. Varying tones of blues play against reds, or purples against yellows, creating harmonious color palettes that play with illusions of depth. The candy-colored canvases in “The Illusive Dimension of Color” are deceptively complex.